Every year skiers anxiously await the results from ski tests across the world. Every ski manufacturer releases something new each season and skiers want to know what’s best, but is that really fair? Is there really such thing as the best ski? Ski magazine tests typically score skis and list them from best to worst, a system that in our opinion is flawed. You may have heard us say it before, but we don’t believe a single ski is necessarily better than others. Every skier is different and every skier has a unique set of demands and expectations for their equipment. After some internal discussion surrounding the potential inaccuracies of listing skis from best to worst we decided we would host our very own ski test. Hosting our 1st Annual Ski Test was a lot of work, but was very rewarding and we think provides an excellent resource to help you choose your new skis. We started by determining how many skis we could realistically test over the course of three days given the amount of testers we expected to have. We were able to narrow down a massive list of skis to a total of 122 that covered 14 different manufacturers. These skis were then split into 3 main categories for both men and women: frontside, all mountain, and freeride. We then split those categories in half and assigned each group of skis a color code. These color coded lists of skis were printed on card stock, which is how skis were assigned to each tester. 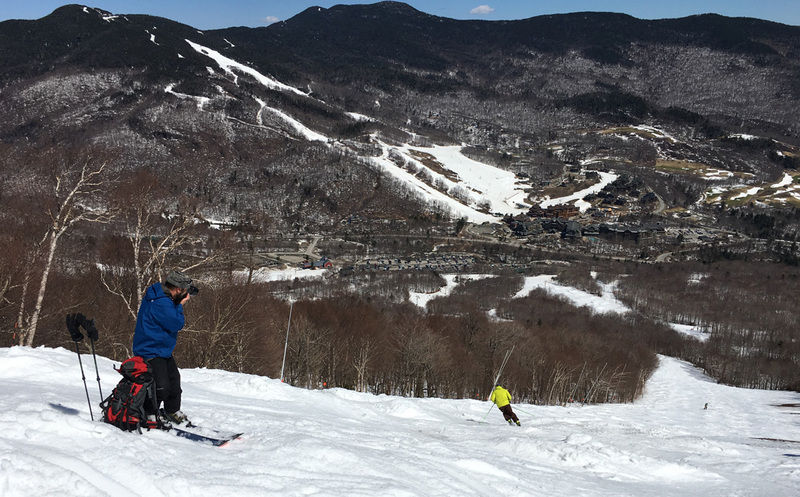 We hosted the test at our home mountain, Stowe Mountain Resort. A big “Thank You” goes out to the Stowe Marketing and Mountain Operations departments for allowing this event to take place and giving us the space we needed. Early in the morning on April 5 with the help of the SkiEssentials.com staff our 14 brands each set up a tent with multiple lengths and quantities of each ski we wanted to test, with some extras thrown in for fun. After our 38 testers arrived we gathered everyone into a kick-off meeting to discuss how the test would go. Each tester was given a color-coded list of skis along with a test form. Testers were prompted to score each ski on flotation, stability, quickness and maneuverability, playfulness, forgiveness, torsional stiffness and edge hold, versatility, and overall impression on a 1 to 5 scale. “Wait a minute, they said they’re not listing skis from best to worst,” you’re thinking to yourself right now. You’re right. These numbers have not and will not be published and were only used internally to gauge each tester’s reaction to each ski. In fact, the variance in scores between testers only further supported our theory that listing skis from best to worst by numerical values just doesn’t work on a grand scale as each tester is unique. Compliments are in order for Jeff Neagle, who spent a majority of the first two days chasing ski testers with his camera, somehow focusing on both getting the shot and surviving a plethora of flat-light related dangers. In addition to the numerical scores testers were also asked to, “characterize this ski (personality, strengths, weaknesses, degree of versatility, shape/performance relationship, who/what it’s best for, etc. )” We provided half of a page for open ended responses to skis, which is where we received some of our most valuable feedback. The first day of the test went as smoothly as we could have asked for and our testers got through an impressive amount of skis. Our first day of testing had some interesting weather and interesting snow conditions, which at first seemed detrimental, but actually proved to be quite valuable. During the days leading up to our ski test Stowe was stuck in a freeze/thaw cycle and we had some light rain and snow falling off and on throughout our first test day depending on elevation. While this initially dampened spirits, it actually provided some great testing conditions. The snow was incredibly firm first thing in the morning, which allowed us to test edge grip and torsional stiffness of carving skis. By mid-afternoon the snow had softened across the entire mountain leaving some slushy spring conditions that were great for testing maneuverability, stability, forgiveness, and even flotation in a sense. 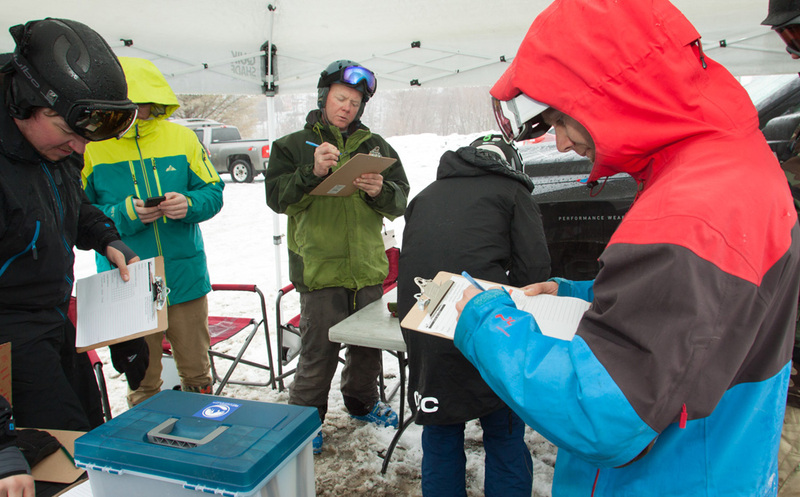 Back at base camp, ski testers record their thoughts on test forms. The teal bin in the foreground became filled with hundreds of reviews. After a successful first day of testing we ended with a recap meeting and headed down to the famous Matterhorn Bar and Grille for some Apres. The excitement and enthusiasm among our testers was obvious and infectious. Everyone wanted to share their favorite ski of the day, talk about where they found the best conditions, what they wanted to test the next day, and shared stories of braving fog, rain, and tricky snow conditions. This high level of enthusiasm and the positive attitudes of our testers were arguably the most valuable aspects of the test and we owe you all a huge thank you. Our testers did such a good job on day 1 we actually got through more of our list of skis than expected, which allowed some skiers to get on certain skis that weren't initially on their lists to even further round out our feedback. The weather on day two was relatively similar to our first day, which again provided a range of conditions that were great for testing. By mid-afternoon we had far exceeded the amount of data and feedback we were expecting, so we decided to call it a day. Although we had a third test day scheduled the following week, most of the 14 manufactures could only stay for these two days, so we held a big meeting to recap the event and thank everyone before heading down the Piecasso Pizzeria to again enjoy food and stories of the day. The following week we reconvened at Stowe with a smaller group of testers and a selection of skis we held on to from those 14 manufacturers. While we accomplished just about everything we set out to in those first two days, the third day was used to round out feedback on certain skis, cross the t’s, and dot the i’s. The weather, thankfully, couldn’t have been any different from our first two days of testing. 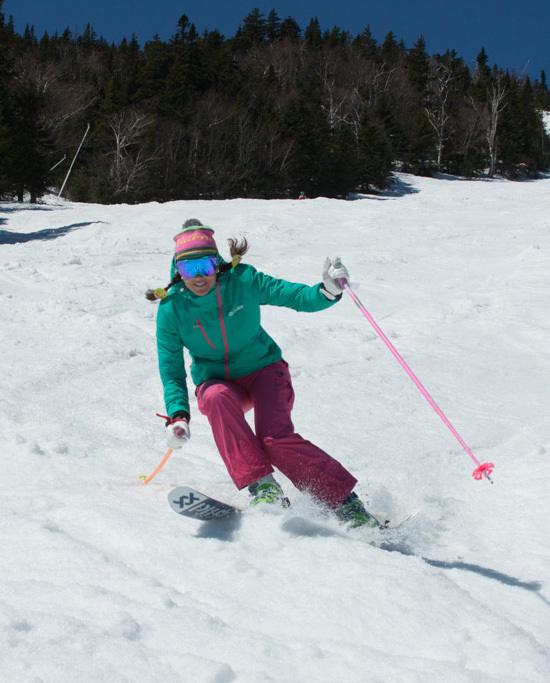 We were treated to perfect blue skies, plenty of sun, and soft, somewhat spring-like conditions. It made for a really enjoyable day on the slopes where we all stayed together as a group, setting up photo and film opportunities whenever possible. With the testing completed the task shifted to organizing, analyzing, and publishing the results from the test. All the test forms were organized by manufacturer and by ski. The tests forms were gone through in great detail, highlighting reoccurring themes as well as outliers within the feedback. We also organized each ski by who tested it, as we wanted skiers to be able to find the tester that they aligned with best and have the ability to quickly and easily see what skis that person tested. Organizing, analyzing, and producing the results from the test was a length, challenging process that required close attention to detail over the course of many months, but we are extremely happy with how it came out. Since the test was published we have received some amazing feedback. We’ve had hundreds of comments from skiers complimenting us on the design and content from our ski test and how much it has helped them determine their future skis. We invite everyone to leave a comment anywhere on the ski test if you have any additional questions regarding certain skis, specific questions for testers, etc. You’ll find a comment section on the bottom of every ski page and every tester page, and of course you can always reach out to us directly. We will be hosting another ski test this coming season to look at 2019 models, so look out for that next summer, and in the meantime we hope you thoroughly enjoy our ski test and hope it helps guide you towards your new skis! Head on over to the Ski Test Results and join the conversation!